I always find it interesting to look at the guru portfolios I run on Validea, and ask the question “what is working” now? Over the last month, in a period where the S&P is up 0.4%, 11 out of Validea’s 13 portfolios have outperformed. 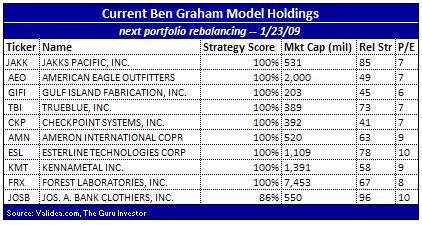 The best performer is my Ben Graham strategy, up 9.4%. Incidentally, the Graham portfolio is also the best long term performer (up 89.3 percent vs. -12.9% for the S&P since July 15, 2003). The table below shows the performance of the 10-stock portfolios I run over the last 30 days. In looking at the specifics, Graham’s approach limited risk in a number of ways, and my Graham-based model lays out several of those methods. For example, one key criterion is that a firm’s current ratio — that is, the ratio of its current assets to its current liabilities — is at least two, showing that the firm is in good financial shape. The approach also targets financially sound firms by requiring that long-term debt not exceed long-term assets. Two other criteria the Graham method uses to find low-risk plays: the price/earnings ratio and the price/book ratio. Graham wanted P/E ratios to be no greater than 15 (and, as another signal of his conservative style, he used three-year average earnings rather than trailing 12-month earnings, to ensure that one-year anomalies didn’t skew the ratio). For the price/book ratio, he used a more unusual standard: He believed that the P/E ratio multiplied by the P/B ratio should be no greater than 22. By using these conservative, fundamental-focused measures, Graham earned himself the moniker “The Father of Value Investing”. And as the father of that school of thought, he inspired a number of famous “sons” — Mario Gabelli, John Neff, John Templeton, and, most famously, Buffett, are all Graham disciples who went on to their own stock market greatness. Perhaps the most intriguing part of Graham’s strategy is that, while it was published almost 60 years ago, it still works today. Since I started tracking it more than five years ago, my 10-stock Graham-based portfolio has racked up an impressive gain while the overall market is down.